For this edition of Top eBay Chess Items by Price, the item pictured below was the least expensive on the short list for the previous fortnight, but the most interesting for me, because it ties in to a previous post. 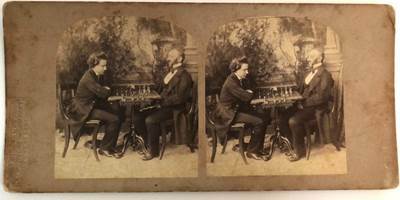 Titled 'Rare c.1850s stereoview US/New Orleans Chess Prodigy Paul Morphy', it sold for US $425, Buy-It-Now. For sale is an exceedingly scarce photographic stereoview of US/New Orleans chess prodigy, Paul Morphy, playing Hungarian champion and President of the St. James Chess Club, Johann Löwenthal. Stereoview was made by the London Stereoscope Company in circa 1858, and bears the company's blind stamp in the lower left hand corner. Some wear and fading, but the image is otherwise clear and in good condition. It bears the story of Morphy's ascent from the Louisiana backwoods as a young teen to the top of the chess ranks. Morphy is widely considered to be the best player of his era and the unofficial world champion. He defeated (usually very easily) most of the major players in Europe, and is considered by some to be the greatest prodigy of all time. This is a photo of his 1858 match versus Löwenthal, which he won handily. Scarce. More accurately, the company's stamp in the corner said 'The London Stereoscopic Company, 54 Cheapside'. As for 'Morphy's ascent from the Louisiana backwoods', I'll transcribe the back of the card in full, not because it adds to the Morphy record, but because it doesn't appear to have been transcribed before. Paul Morphy was born in New Orleans, on the 22nd of June, 1837, his Mother was of French and his Father of Spanish origin; Paul's earlier years were passed at the Jefferson Academy in the place of his birth ; in 1850 he became a student at St Joseph's College, Spring Hill, near Mobile, Alabama; he graduated from this institution in high standing in 1854, but remained another year as resident graduate, since that time he has devoted himself to the study of the law. Paul's parents were fond of chess, and he was initiated by them at the age of ten. In May 1850, M. Lowenthal the distinguished Hungarian passed through New Orleans; on the 22nd and 25th of that month he played with Paul, (at that time not 13 years of age,) in the presence of a large number of amateurs, the first game was drawn, the second and third were won by the invincible young Philidor. It was with great prestige that Paul Murphy arrived in New York on the 5th of October, to take part in the first Congress of the American Chess Association, and he overthrew, either in the grand tournament or in side play, one after another of those men who had long been looked up to as the magnates of the American Chess world; since then Mr Morphy has visited England and added widely to his fame by the conquest of Messrs. Lowenthal and Boden, defeating the former (in a match for £100 a side) at the rate of 3 games to 1, and the latter in the proportion of 5 to 1. At Birmingham on the 27th August, 1858, Mr. Morphy contested 8 games, without the aid of chess board or men. against 8 members of the British Chess Association. with the unparalleled result of his having won 6„ drawn 1, and lost 1 of the 8 played, a performance which Lord Lyttelton pronounced the most wonderful thing he had ever witnessed. At a grand banquet given to Mr. Morphy in Paris, a marble bust of him was crowned with laurels amidst the loudest acclamations. On April 25th, 1859, Mr. Morphy played simultaneously 5 of the most renowned players of the St. James's Chess Club; the game at the 1st table was won by Mr. Morphy, at the 2nd it was drawn, at the 3rd it was won by Mr. Barnes, at the 4th it was won by Mr. Morphy, at the 5th it was drawn. The stereoview establishes the place of the scenes shown in an earlier post, Morphy, Loewenthal, Young Man, and Lady (November 2011), to London.